The 12-inch diameter Crystle Earthsphere is suspended on a hand-cut and polished clear rod – the globe appears to be floating above the base. The 9 inch diameter clear base complements the Earthsphere. The overall height of this world globe is 15-inches. Earth sphere presents the most up-to-date cartography. The land masses are expertly silk-screened by hand on the interior surface of museum quality acrylic sphere. Earth sphere includes a Certificate of Authenticity signed and dated by the craftsman who created it. 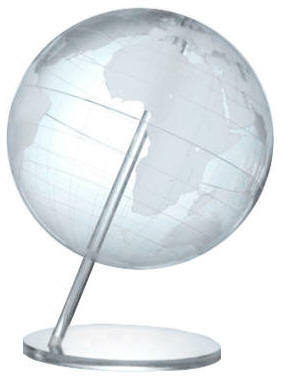 We appreciate your interest in Artline Globes by Spherical Concepts.